Panda eyes, Dark circles, tired eyes, no matter what you call them you’re likely to suffer with them at some stage of your life! From cucumber slices to potato there are plenty of homemade cures that people swear by! Let’s take a look at what actually works for your dark circles! What Causes Dark Circles or Panda Eyes? 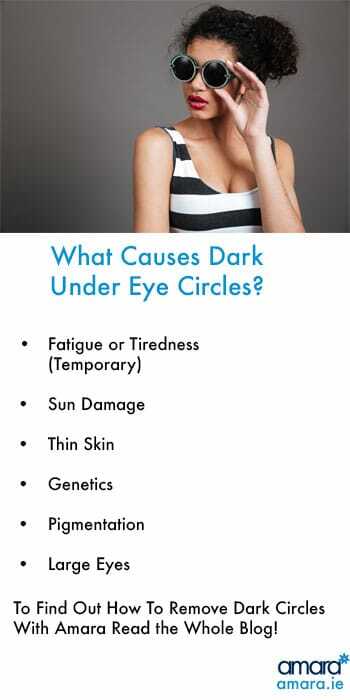 There are many different reasons why we may get dark circles some of these may be temporary like lack of sleep or allergies. This is due to the blood vessels under our eyes dilating, the dark circles are actually our blood vessels that you can see under the thin skin of our eyes. Typically for tired eyes getting rest will help them disappear. However, if you maintain a state of tiredness then they may become a permanent fixture. If your parents had dark circles then it’s likely you will too. Depending on your ethnicity it may be caused by pigmentation under the eye. Some people with high cheekbones or large eyes can look like they have dark circles simply because of the hollows under their eyes. This can be because of a lack of collagen or simply a shadow under their eyes. Many people think that the sun can somehow brighten dark circles, but it will definitely make it worse. The sun would make actually make the skin under your eyes darker. The skin under eyes is so thin that the increased blood flow shows up so easily. How Can I Fix Panda Eyes? For starters wearing SPF daily is essential for maintaining your skin, dark circles or not. The sun’s UV rays are very harmful to your skin and will cause premature ageing, pigmentation and will make scars and imperfections darker. Wear a minimum of SPF 30 (we recommend 50) daily all year round. The eyes are typically the first areas to age and just a small dip of the eyebrow can age us about 10 years! As a result, ZO Medical by Zein Obagi has created HydraFirm Eye Brightening Repair Cream. This cream helps with puffiness, dark circles as well as fine lines around the eyes. Retinol helps remove lines, caffeine helps reduce puffiness while shea butter will help repair our skin barrier. There is a host of other ingredients along with optical diffusers that work together to get the most benefits out of your cream. This is available with a consultation only and works best if you are already on a good skin health regime. Depending on what is causing your dark circles, under eye filler (Tear Trough) Filler may help. By adding Juvederm Filler under the eye this can fill out the hollows that are actually causing the dark circles. This can be discussed at a consultation to see if it is the right treatment for you. This is a specialist filler treatment that many doctors are unable to offer, however, we do offer it here at Amara. Treatments such as the HydraFacial MD can be added to your routine to create an overall healthier glow. 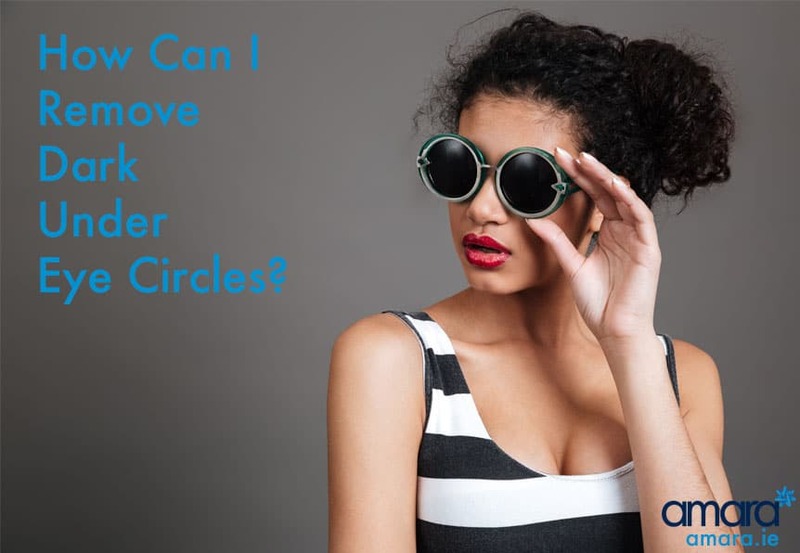 Healthier skin is also less likely to get dark circles. Micro-needling treatments could also be of use to thicken the skin under the eyes and create a more even skin texture. Do you suffer from Panda Eyes or Dark Circles? Contact us now for a consultation to see what treatment is right for you! You added very informative article for us. I’ve been using eye cream under eye treatment. I always use it on twice a day, And I noticed a lot of improvement with the dark circles under my eyes. Its very effective cream for dark circle treatment. Thanks for sharing. Hi there. I am very interested in getting under eye fillers, but wanted to ask – how long does it take for the fillers to dissolve? Is it a frequent procedure? Our doctors choose from one of three different fillers from the Juvederm Vycross range of fillers to treat under the eyes. These are the highest quality fillers available today and are licensed for a minimum of 12months. How quickly your body absorbs them is very patient dependent. Tear trough treatment was the fastest growing treatment in our clinic last year, and our doctors perform this procedure weekly. It’s highly effective and results are excellent.